Starting out as your average acoustic singer-songwriter, Ellie Goulding has evolved into a synth-pop, BBC Sound of 2010 and BRIT Critics’ Choice Award winner. 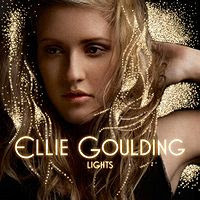 But her debut album, Lights, is less than impressive for an artist of such critical backing. It falls short of a electro-synthpop gem, and is far too over produced to be a folk treasure. With Starsmith’s production and with his reputation as the remixer du jour, you’re almost guaranteed a good record, which this is, but it’s just not great. Maybe it’s because Ellie’s not quite comfortable with the genre, or maybe she just needs to grow a little as an artist first. It just seems to me that the record is a little premature. The singles, Under The Sheets and Starry Eyed are possibly the best pop/dance tracks on the record. The piano driven ballad The Writer is beautiful, and has a glossy feel to it and a good remix would really make it shine. Wish I Stayed and Everytime You Go are in my opinion the best tracks on the record. I’m sure Ellie’s music will feature on Grey’s Anatomy at some stage through the season, it feels like it will lend itself well to a Grey’s Anatomy sad moment. Ellie’s voice fits nicely into the dainty, puckish sound of the likes of Joanna Newsom. But her voice, unfortunately, cannot carry the weight of this record alone. It’s no Lungs or The Family Jewels, but we’ll see what the future holds for her, she is still very young.